In the summer of 2017, students, volunteers, FarmCorps and AmeriCorps NCCC members undertook the task of constructing your newest school garden at Manaugh Elementary School. They built five large, wheelchair accessible raised beds, plus a grey water system and wicking bed. In addition, they laid the foundation for outdoor kitchen area, installed posts which will soon hold shade sales, stained benches, set up the sink, and buried all of the irrigation lines for the orchard. 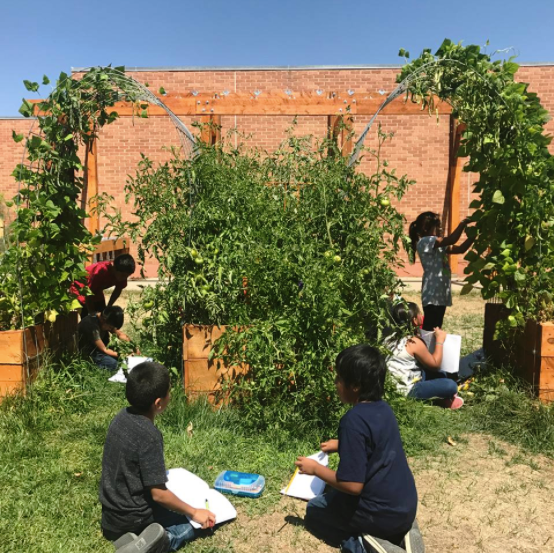 The amazing Manaugh teachers are already embracing the new outdoor learning space and taking their classes outside to harvest, explore, and engage with the natural world. Additionally, MSTFP is now teaching classes out in the garden. Special thanks to the administrative staff and teachers at Manaugh for the dedication and momentum they brought to this project, and to the Cortez High School Ag Class for building Manaugh's garden shed. Come visit the Manaugh School Garden!